Southwest Microwave has announced immediate availability of Perimeter Security Manager II (PSM II), an advanced, Windows®-based security monitoring and control application that provides powerful intrusion detection system management capabilities. The system is ideal for users seeking to manage numerous perimeter security devices and visual assessment tools across single or multiple networked locations. PSM II monitors, displays and controls Southwest Microwave’s complete range of INTREPID™ intelligent perimeter detection systems, including the MicroPoint™ II fence detection system, MicroTrack™ II buried cable detection system and MicroWave™ 330 digital microwave link. PSM II also manages contact-closure auxiliary security devices and facilitates high-level interface to CCTV cameras, digital or network video recorders and monitors to achieve comprehensive site protection. This latest release introduces patented Migrating 3+ technology, giving users the unique capability to distribute control across multiple dedicated workstations so that if one becomes disabled, drivers are seamlessly migrated to a second with no interruption or downtime. Independent device and alarm status, SQL server database and GUI engines enable for real-time access to information. Easy site navigation with configurable portals to effortlessly link to detailed views of specific areas of the site’s perimeter. User-programmable scenarios that automatically trigger a series of actions when one or more events or alarms occur, reducing risk of human error. Clear on-screen event handling instructions for operators to ensure prompt and accurate response customized to a facility’s unique security needs. The ability to incorporate high resolution 2D or 3D graphics in common formats to optimize site detail for the operator with customizable views. Advanced alarm handling and reporting proficiency, offering detailed audit trails of operator activity and alarm events. 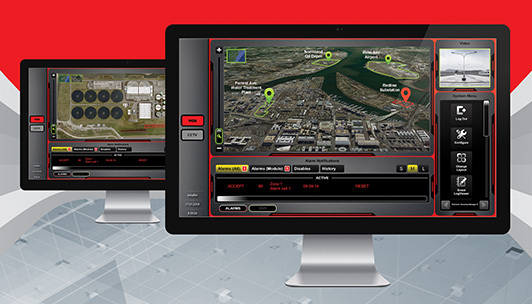 Learn more about Perimeter Security Manager II. Contact us to discuss your perimeter security project with a Southwest Microwave professional.